Naignouma Coulibaly (left) is the queen of NF1 basketball rebounds. She picked up a total of 25 this weekend, also scoring 25 points in the victory of Pleyber-Christ against Lyon (73-61). The match between Pleyber-Christ and Lyon was not enjoyable to watch as both sides only hit 30% of their shots. Mélanie Arnaud was the best player on the court and scored 23 points for Lyon while Candyce Sellers contributed 18 points before fouling out. Lyon were unable to handle Coulibaly and picked up a total of 14 team fouls trying to guard her. Pleyber-Christ took full advantage during the final quarter. With better shooting from the free-throw line they secured their seventh victory of the season. Caroline Le Fé finished with 15 points of which 10 came from the free-throw line, while Aude Kernevez and Mélanie Venier added 13 and 12 points each. Pleyber-Christ was the only team to win at home this weekend. The game between Rennes and US Laveyron was postponed due to swine flu. Union Hainaut Basket-Saint Amand ran out winners (82-63) against Tours. A 10-2 run during the second quarter (36-27) put them in the lead for good. Clémence Beikes led the scoring with 24 points. Charleville-Mézières led from start to finish against Charney-lès-Macon and won comfortably (89-42). Five players finished in double digits with Alexia Kusion and Zuzana Ondrejova both scoring 17 points. Illkirch-Graffenstaden blew an 11-point lead (50-39) in the final quarter against Dunkerque Malo. Yet they managed to win thanks to two free-throws by Charline Servage in the last ten seconds (60-58). Darline Nsoki was the match winner for the SIG with 20 points which included a perfect 8-of-8 from the free-throw line. The SIG now move into third place, while Dunkerque drop to fourth. Roche Vendée stay in fifth place after beating Voiron (76-68). CSP Rezé beat Reims (61-60). Reims led from the end of the first quarter until three seconds till the end. Marie-Vincent Santa-Cruz scored the two free-throws to win the game. The CFBB were just three seconds away from a victory against Nice BC 06 when they lost the ball. Nice tied the game (65-65) and went on to win in overtime (75-69). 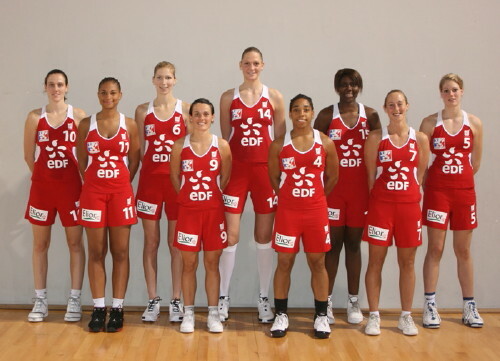 Emilie Petiteau-Silbande (right) led the scoring for Nice with 20 points.